In Return to Brookmere, you will be an elven fighter named Brion. As Brion, you are five feet tall and weigh 100 pounds. You have shoulder-length honey blonde hair, pointed ears, and brilliant gray-green eyes. Like all elves, you have elvensight allowing you to see object up to 60 feet away in the dark by the heat they give off. Although elves are not as strong as humans, they are very clever and quick. Elves are able to speak the languages of orcs, goblins, hobgoblins, and gnolls as well as the "common" language of humans. For your adventure, your father, King Cedrus, has given you a finely made suit of silvery chainmail that covers you from head to waist. Chain mail looks like a heavy knit silver sweater but its woven from metal, not wool. Chainmail is light, flexible and will protect you in combat. You wear your chainmail under a purple wool tunic. Sturdy black leather breeches and tall black boots complete your outfit. You are armed with a sword and a dagger and carry a polished metal shield. A leather pouch filled with food and water is tied at your waist. There is a heavy gold chain around your neck. At the end of the chain is a golden charm, worked in precious gems, in the shape of dragon's head. The charm is the fabled amulet, the Mouth of Mimulus. With the help of this magical necklace, you will be able to speak with and understand any creature you meet on your adventure. The dangers awaiting you will challenge your skills to the limit. Gather your wits about you. Take a firm hold on your sword, and take the first step into . . . adventure! 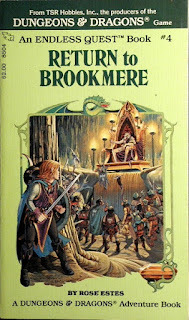 This was the first of the Endless Quest series I read when I was ten years old. 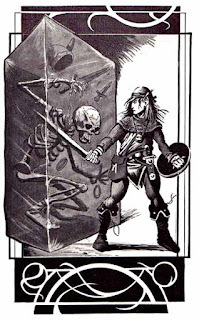 As a young player I voraciously poured over the series when I could not gather anyone to play D&D with. There was a total of 36 books in the original series all released during the 1982-1987 time frame. Most of my collection was lost over the years or destroyed in a basement flood. But I have managed to slowly cobble the collection back together using sites like Ebay. 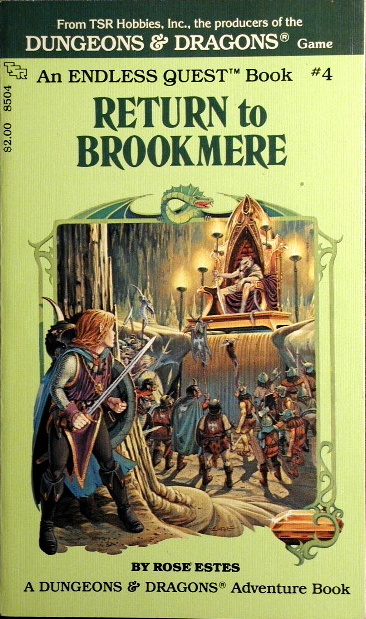 Return to Brookmere will always be my favorite because as a young reader it was very absorbing. I must have tried every possible combination of results before finally putting it down. Tim Truman's interior art I have always found to be very compelling and thumbing through the book creates nostalgia. I enjoy the full color art in many modern systems but nothing can beat the old back and white drawings. If you have any young gamers in your house these books would be worth picking up as a holiday gift. Especially if they are fledgling D&D players since they will encounter everything from a talking amulet to a gelatinous cube! 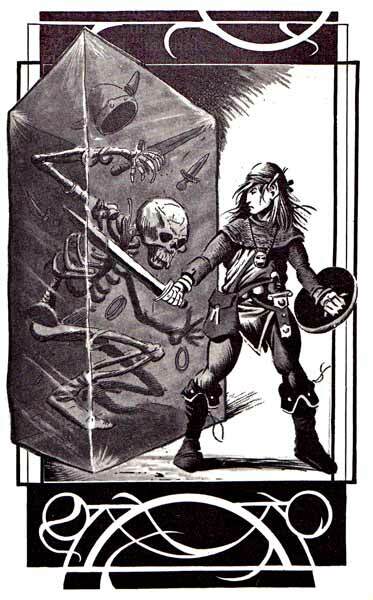 Granted the books have no characteristics, maps, or combat rolls but capture the essence of D&D very well. So what was your favorite Endless Quest book? Have you ever converted any of them into an adventure for your players? And most importantly do you still have any of them in your collection?